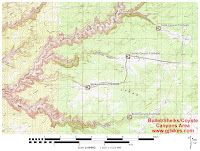 Coyote Canyon is located in the Cedar Mesa Area near Blanding, Utah. The canyon is a tributary of the Grand Gulch. A large spillover with a drop of several hundred feet precludes being able to access the Grand Gulch from the upper reaches of Coyote Canyon. There is at least one ruin within the canyon that makes it somewhat worthwhile to hike. At present there are no trail signs, cairns or markers of any kind and without the aid of a map or GPS there is no other way of knowing exactly where you are. To get to the unofficial trailhead drive south on Utah Highway 261 for 4.6 miles from the Kane Gulch Ranger Station and turn right onto San Juan County Road 250. Follow CR #250 as it crosses Coyote Flat for 2 miles where it turns sharply to the left and crosses Coyote Wash. The only parking at this spot is where a grader has planed off a swath on the right just before crossing the wash. Under dry conditions a low clearance 2-wheel drive vehicle should be all that is required to travel the first 2 miles of CR #250. From the road follow a well worn path that travels along the wash that eventually drops into it or just head straight over to the wash and begin following it downstream. After following the wash for awhile it will come to a small spillover that is easy enough to get past when there isn't a large pool of water to deal with. In that case one would need to search out a route to get around it. The canyon is getting progressive deeper by the time it reaches the 1 mile point. We hiked Coyote Canyon the day after hiking Sheiks Canyon and noticed that Coyote Canyon had quite a bit more water available. That coupled with some fresh deer and elk tracks had us considering it a good location for ancient activity. At the 1.4 mile point from CR #250 there are some fallen ruins where there is a well preserved intact granary on a bench above the wash on the right hand side. We were standing in the wash looking up at the spot thinking that it would be a good place for a ruin even though nothing was visible from below. Then we looked down at the ground and noticed a midden that ran all the way down the cliff to the edge of the wash. The entire midden was strewn with numerous shards of pottery, pieces of chert and an occasional corncob. It is a pretty good scramble to get up to the ruin. If you make the climb be sure not to step in any of the midden. Pretty much all of the walls have fallen but there is one intact granary that still has the flat rock that was its door leaning against it. One of the remarkable aspects of the site is the variety of pottery represented there. Be sure to return all specimens to where they were found so that others can enjoy them. Also remember that it is illegal to dig for or remove artifacts or to damage a site in any way. If you continue down the wash to about the 2.5 mile point you will come to a spillover that drops several hundred feet straight down into the canyon below. Even though a guide book we had said that it was possible to hike all the way to the Grand Gulch it became apparent that the author had never actually done that. We hiked all the way around the bowl to the left and to the right and there is no way to get into the canyon without doing a repel. 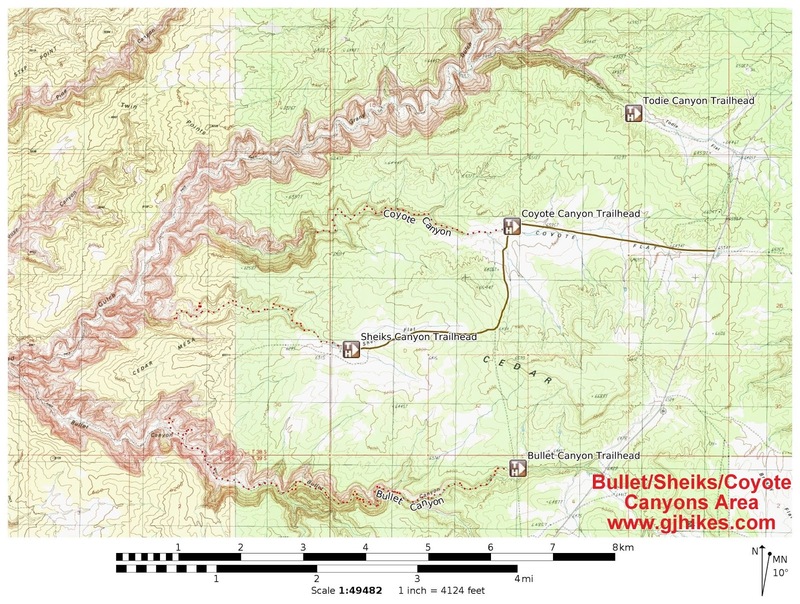 Coyote Canyon is one of the easiest hikes in the area around Grand Gulch. While we were there we found one other minor site where there was a remaining section of wall that was only a couple of layers high but had a good layer of mortar holding it together. There may have been other things that we missed as we weren't trying to do an extensive inventory. For us Coyote Canyon was more of a short something to do that was near our camp in Coyote Flats. Others that have a little extra time on their hands might find it interesting as well. If you would like to see it for yourself then all you have to do is 'Take a hike'.